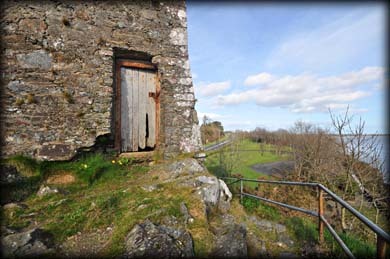 The rectangular four storey tower house at Ferrycarrig is built on a rocky outcrop on the north side of the river Slaney. The tower has commanding views of the ferry crossing and surrounding area. Records show that Alexander Roche passed the ferry to his son in 1555 and that a Walter Roche was in control of it in 1641. The first bridge across the Slaney was built in 1794. Unfortunately there is no public access to the interior of the tower. 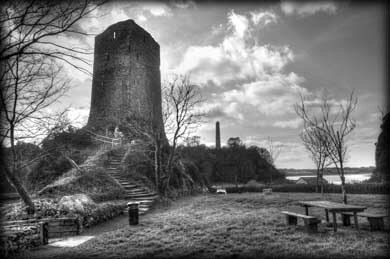 On the south side of the river is a round tower, see image below, built in 1858 to commemorate the men of Wexford who died in the Crimean War. Situated: Very easy. The tower stands on the eastern side of the N11 where the road crosses the Slaney River. Discovery Map 77: T 0154 2324. Last visit Mar 2014.